Keeper is a breeders dream...and Ann Gunderson is a breeders dream of a person to find that gives a home to a dog and continues to prove that dog in so many different venues. I cannot say enough about either Ann or Keeper without sounding gushy!! Ann came to meet the boy I thought would be just right for the activities she wanted to do with a cattle dog. Ann arrived down from Canada with her friend and maybe 5 very large gorgeous Pointers. Keeper was not at all intimidated walking underneath all these giants, he fit in from the start. Ann kept me updated and the time went on and there were so many many venues they were doing together successfully. EVERY title that K.eeper garnered was with Ann, I finally got to see them in action at the 2007 Canadian Nationals in BC, Canada. That boy was so focused on Ann it was understandable why they were doing so well, plus he is one of those silly boys that does everything with a huge cattle dog grin! I asked Ann to write about Keepers performance history -- WOW..I am so impressed!! At least we now know how she stays so slim!! When I first called Lynda about a cattle dog, she asked me what I wanted. I told her that I wanted a dog that could do everything. She did not let me down. Keeper, at 6 years in Apr 2010, has earned 34 titles and some very nice accomplishments. 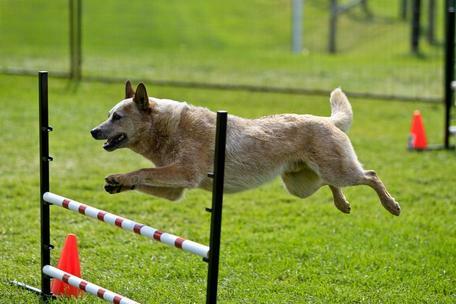 At the American ACD National specialty in 2007, Keeper won the American Bred class. He also finished his AKC CDX and earned two legs towards his Rally Excellent title. That same weekend he earned two agility legs. Now that’s versatility. At the Canadian ACD National specialty of the same year, Keeper won Reserve High in Trial in Obedience. Keeper was Number 3 Obedience ACD in Canada in 2006 and 2007. He made Number 1 Obedience ACD in Canada in 2008. 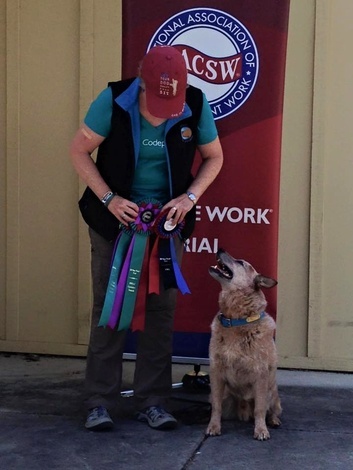 As 6 year old he has earned 3 Championships in Canada: Conformation Champion, Obedience trial Champion, and just recently Agility Trial Champion of Canada. Thank you Lynda, for the most amazing dog. My 24/7 companion and friend who wants nothing more than to be at my side and figure out just what it is I want him to do. 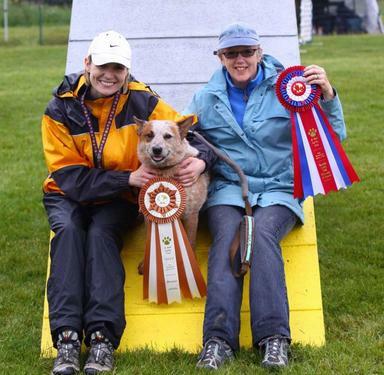 This picture is of Keeper and Ann and the judge when they earned the Agility Trial Championship of Canada and their Bronze award of merit. This is Keeper at the Nationals I LOVE this pic!! CONGRATS Ann!! !